With all the different types of cloning gels out there, we decided to test and write an in depth review of the the best cloning gel out there to fit your needs. When your growing cannabis plants sometimes you want to keep a strain of some good genetics. Or instead of starting your plants from seed, the best way to do that is to take a cutting to make a clone. There are many ways out there to start the cloning process off and one of the best ways is to use cloning gel. We go over the organic, natural and rooting hormone gels on the market for you to use to get the best results the fastest. If your wondering what cloning gel is, we have you covered and what is the benefits of cloning gel and rooting hormones. 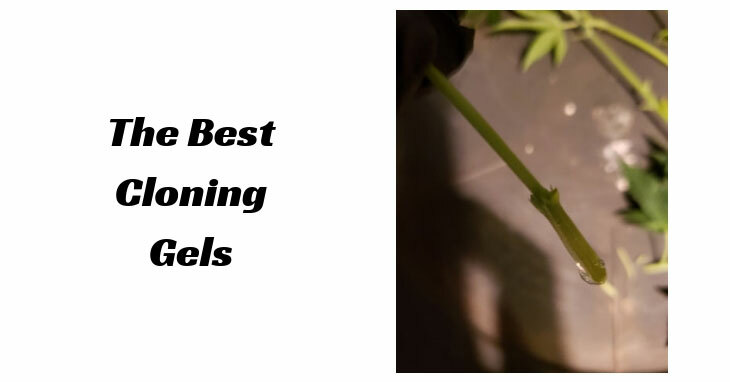 An added bonus of how to use the gel on your new cuttings to make sure you have close to a one hundred percent success rate making your new clones. Cloning gel is a combination of natural and organic ingredients some include natural hormones such as indole-3-butyric acid (IBA) for plants. The gels also include vital nutrients such as nitrogen phosphorus potassium calcium. When these are combined a gel-like substance an applied to the tips of your cuttings will produce fast root growth. This is just one type of rooting substance there also is rooting powders and cloning solutions in liquid form. The HydroDynamics Clonex Rooting Gel is a premier choice when looking to get the best success rate in with your clones. Clonex comes with a full spectrum of vitamins and minerals to supply your new cutting for fast and vigorous growth. This rooting gel has been around since 1988. A popular choice among growers, this gel has some mixed reviews on success rate. Here are some tip on how to use the clonex. With this gel it is best not to dip your cutting into the bottle directly , use an extra small container and place a bit in to it. One trick t keep it to last a long time is to store it in the refrigerator. The clonex gel is mainly used for propagation mediums like rockwool, rooting plug, and peat, coco coir pellets. They do have a cloning solution available for cloning machines. The rootech cloning gel is made with a unique blend of rooting hormones to ensure even the toughest plants can grow some roots. The wide mouth jars that the gel comes in makes it easy to use and dip your stems into without waste. Rootech provides your clones with the much needed nutrients it can immediately use. This will promote a fast rooting time. The gel is made extra thick and very smooth for easy transfer. One thing cool with the rootech cloning gel is that you can dilute it in water to put into your cloning machine. Or dip rockwool or your rooting plugs. The Olivia’s cloning gel provides a fast way to root your cuttings. This cloning gel helps to prevent transplant shock of your new clones when transfering to medium. Olivia’s cloning gel is easier to use than powders or liquids, simply dip and go. Providing the essential nutrients for them to root at a successful rate. The gel will also prevent air bubbles when putting it into rockwool or rooting plug of your choice. Olivia’s also has a cloning solution , if you would like to use in a cloning machine. The IBA Rooting Gel from Midas Products is a superior way to get roots to your new clones. The cloning gel is made from special unique ingredients promote fast growth. The IBA rooting gel boast that is it is far superior to rooting powders on the market and last a long time up to two years on the shelf. The rooting gel is very easy to use for the beginner to pro simply take some gel out of jar put into a shot glass or a small container, dip you new cutting in the gel and transplant. The cloning gel coats the new cutting to prevent air bubbles when putting it into your medium of choice either rooting plugs or rockwool , coco or peat pellets. With great reviews on amazon this may be the one you’re looking for. The EZ Clone Rooting Compound Gel is specially designed to be used with the EZ cloner machine. You can also uses this gel to be placed in propagation mediums like rockwool or pellets or other cloning machines of your choice. This gel provided the full spectrum of vital vitamins and hormones the cutting need when first starting out. Whats is special about this gel is that it is water based and can be used in machines instead of purchasing the cloning liquid separately. This gel will promote roots very quick for you faster than rooting powders. We found this worked not to bad in a cloning machine. The Rx Green Solutions Life Cloning Gel can be used in a cloning machine or rooting mediums. Making this a great choice for its versatility. The Life cloning gel helps increase nitrogen available to the clone. RX Green solutions claims the clone will root 20 percent faster than most gels on the market. This cloning gel Contains indole-3-butyric acid (IBA) a natural plant hormone, and includes vitamin B1. Also the gel contains natural ingredients , and no synthetic ingredients. RX Green solutions have cloning solutions available. The Quick Clone Gel Is thicker than your average cloning gel on the market. This will ensure that your clones will have the right amount vitamins minerals and hormones to root fast. This cloning gel is made with a base of a tea and other natural ingredients, amino acids, combined into one to promote healthy roots. What’s great about the quick clone gel is that you can use it in various mediums such as peat or coco pellets, rockwool, or other rooting plugs of your choice. One other cool feature is you can use this gel in an aeroponic machine such as a cloning machine. The MaxiRoot Cloning Gel is one hundred percent organic, they are in the process of being certified. This cloning gel is made with all natural ingredients and one special one called Ascophyllum Nodosum. It helps with vigorous root growth. The MaxiRoot can be used with all types of plants and is designed for cannabis plants. Here’s a list of the top three cloning solutions that can be used in your aeroponic cloning machines. The Clonex Cloning solution is a top choice among growers it’s easy to use it is designed especially for cloning machines. Formulated with a B1 vitamin which Helps against transplant shock. This cloning solution also includes nitrogen, potassium, phosphorus, calcium to enhance vigorous root growth. Olivia’s Cloning Solution is an All natural cloning solution with no added hormones. It comes with its own unique blend vitamins minerals and N – P – K to promote solid root growth. A better alternative to root powders and can be diluted to be used in cloning machines. The MaxiRoot clone solution is a great choice if your looking for something organic and natural. Perfect for cloning machine and designed for cannabis growers. Made with special ingredient to promote growth and prevent transplant shock. The main benefits of using cloning gel in rooting hormones is you’ll see faster route development in your cuttings. Than if you were to use natural alternatives and or nothing at all. 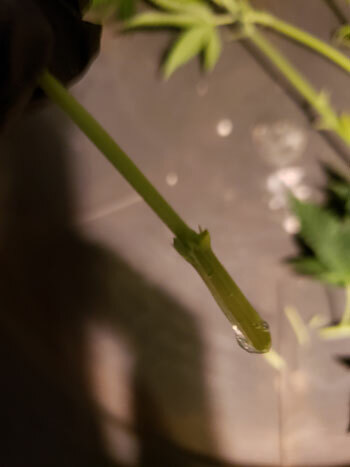 The gel also provides an extra coding on the cone tip I’m having air bubbles form when placed into your cloning medium. Another benefit of using cloning gel is it is diluted better than powder and can last a very long time. One tip to extend the life of your gel is to store it in the fridge. Open your cloning gel jar and in a small separate container such as a shot glass scoop a little bit into the shot glass. Soak your rooting medium such as rockwool cubes, pellets, rooting plugs. Or fill your cloning machine with water an ad the required cloning solution. Take a cutting off your cannabis plant using a sharp blade such as a razor blade and Slice on a 45 degree angle. Score of the tip of your new cutting about half inch above the tip all the way around with the razor blade. Take your cutting and dip it into the shot glass with the cloning gel. Make sure your clone tip is nicely coded. Next place you’re cutting into your rooting medium such as or your neoprene collars for your cloning machine. Place these inside a humidity Dome and make sure the temperature is around 25 to 85 degrees Fahrenheit with a high humidity. After taking care of your new clones, which should appear anywhere from three to seven days. If your thinking of getting a cloning machine, check out our post here for a review on the best ones out there..
There’s a lot of different types of cloning gels on the market and it’s hard decide which one is the best one for you. Most come with all natural ingredients and some include rooting hormones to increase the growth faster. We couldn’t tell the difference between ones that had a hormone and others that did not they all seem to be able to get roots within the set time frame 7 days. We tried a couple different of the cloning gels and we found that these were the best cloning gels out there for you. Do you use cloning gels or liquids? How were your results, which ones do you recommend?